Drumming up dinner one night it occurred to me there was a gap in the blog event calendar for food fixed up in flash. So after a quick chat with my blog buddy Katie at Feeding Boys we dreamt up Speedy Suppers, a new blog event for meals made in under 30 minutes. Speedy Suppers runs from 1st month to 29th with full round ups of all entrants who have mentioned the challenge in their newly published post. 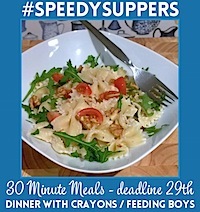 Speedy Suppers will kick off being hosted in alternate months by myself at Dinner With Crayons and Katie at Feeding Boys. Blog any speedy supper or family meal. We don’t mind so much what time of day you eat it, more so that your dish only takes 30 minutes or less to prepare. Please display the Speedy Suppers badge in the post with a link to that month’s announcement and both hosts, myself and Katie. Short cuts and cook ahead elements are actively encouraged i.e. using sauces, frozen food, left over bits and pieces as a component. So long as assembling/the bit where you actually cook it takes under 30 minutes that’s fine. Add the URL of your post to the linky below. This a blog hop so feel free to add the code to your own post so your readers can admire the entries received so far. Please be mindful of copyright, we don’t mind if you’ve adapted something from elsewhere or you made it from scratch. But if you submit something found online or in a book, just tell us where you found it. One picture from each post submitted will be use in the round up, these pictures may also be shared on social media to spread the word about this event i.e. Pinterest, Google Plus etc etc. If you object to pictures submitted being shared elsewhere then please drop me an email. We don’t mind you submitting your entry elsewhere to other challenges but please be mindful of other events’ rules. Boil the pasta in a large saucepan until al dente. Meanwhile use a hand blender or similar to blitz the aubergines and low fat soft cheese until smooth. Drain the pasta and mix with the creamy cheese and aubergine. Serve immediately in bowls whilst scattering and folding rocket leaves and walnut pieces. Add tomatoes if you wish. Easily served inside 20 minutes. 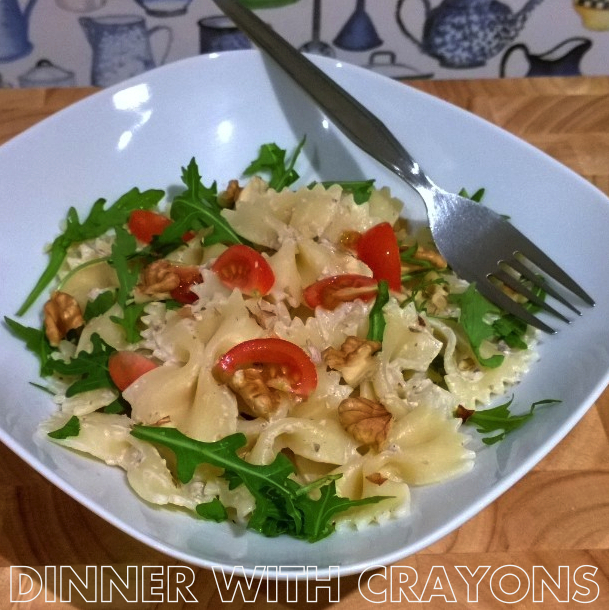 Add your speedy supper dish to the linky below! Don’t forget this is a blog hop so feel free to add the code to your own site and encourage your own readers to take part. 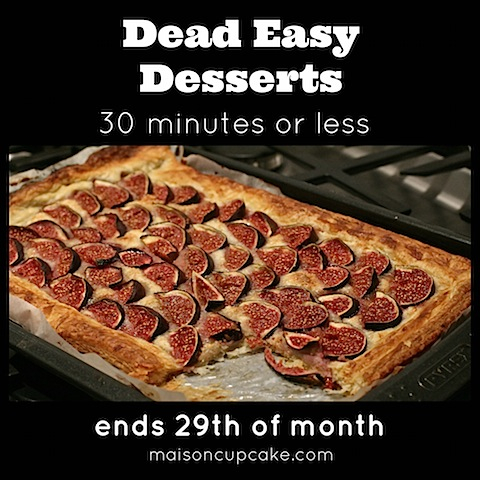 Don’t forget if you have something swift and sweet or pudding like you can enter it into Dead Easy Desserts over at Maison Cupcake which has been extended until Feb 29th after a late start in mid January! Woo hoo, managed to enter with my latest post – takes 30 minutes to prepare and cook! Great idea for a challenge. I’m always in need for inspiration when needing to cook at the end of a busy day. Will try and enter. That farfelle looks totally delicious. Pasta is just ace for speedy suppers. Guessing it has to be something savoury? If you have a dessert, you could enter it into Dead Easy Desserts on Maison Cupcake? I haven’t been promoting that as much as I should! Looks like a fun challenge. GREAT idea for a challenge, and I’ll definitely be joining in! Tasty farfalle recipe too. Excellent – I look forward to seeing your entry! An excellent challenge idea – I’ve linked up! i can’t find the code to copy for the blog hop though….